I guess you could say I've been bit by the travel bug. The more places I go the more places I want to see. Some of those places are across the world and some are only a few hours from home. Which led me to Firelight Camps. 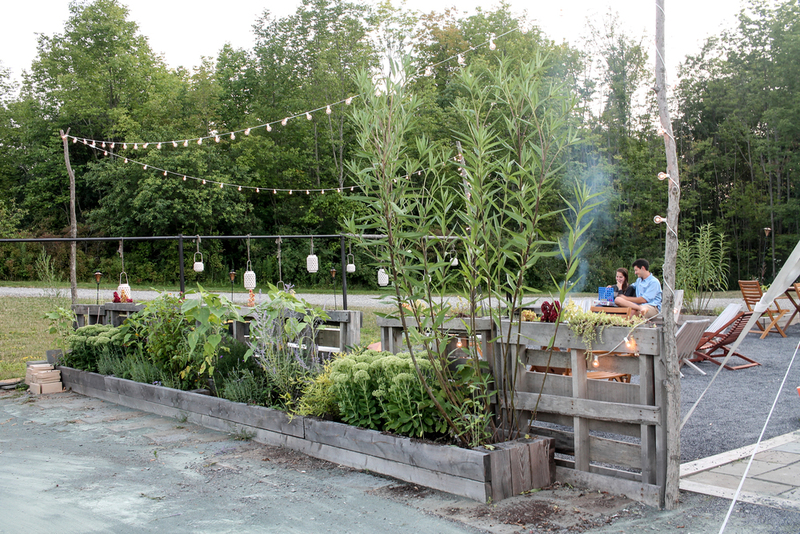 Last August my wish to go 'glamping' came true when my boyfriend and I took a weekend trip up to Ithaca, NY and stayed at this stylish and elevated campground. 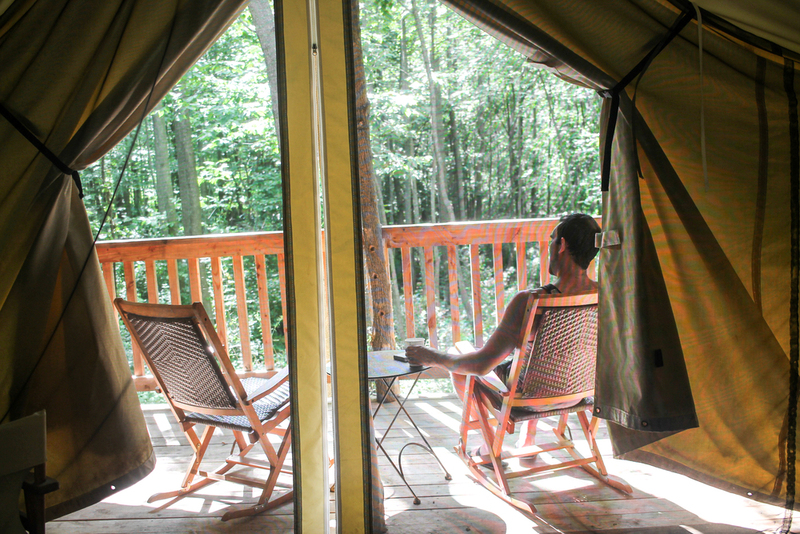 Situated in the Finger Lakes region of New York State and a 4-hour drive from Manhattan, Firelight Camp's backyard is filled with hiking trails, waterfalls, Ithaca's iconic gorges and award-winning wineries making it the perfect retreat for nature-lovers and wine enthusiasts like us. We took our time driving up from the city and stopped at various Seneca Lake wineries along the way before arriving at Firelight. Our favorite being Damiani Wine Cellars - a family-run vineyard atop a hill with stunning views of the region and lake. We started with the Pinot Noir tasting flight and ended with a full glass to enjoy on their outside patio overlooking Seneca Lake - we knew we were off to a good start. Upon arrival at Firelight, we checked in at desk reception located in the furnished lobby tent, and little did we know, we arrived just as the complimentary happy hour was beginning. (lucky for us!). Every evening from 5-6pm a selection of local Finger Lake wines and local craft beers are available for 'glampers' to taste while relaxing in the lounge area. There are books, board games, charging stations for your phones and even an old record player with many old albums to choose from - filling the tent with music. So after we got our glasses of wine, we threw on our favorite vinyl record (The Eagles!) grabbed Uno cards and enjoyed our wine out by the campfire. Once we were ready to check into our tent, we were given the quick tour of the property, starting with the newly renovated bath house which felt more like a luxurious hotel. With individual shower rooms and stalls, this bathhouse had everything we needed, including eco-friendly shampoo, conditioner, lotion and luxe bath towels. They even had hair dryers for the ladies! I loved getting ready here, it was super clean, comfortable and all felt very private. We then walked to our private safari tent (no assembly required!) where we found our tent had an extremely comfortable queen sized bed situated on hardwood floors (yes, you heard me correctly), a desk for writing, a BALCONY! and hammock just outside. TIP: Do bring lots of sweatshirts and layers as it does get quite chilly at night in the woods! There was something so calming and surreal staying in these tents purely surrounded by nature and its sounds - although, for a Manhattanite, I will admit, the quietness made falling asleep a bit difficult. The next morning we woke up early ready to explore. The trail-head for Upper Buttermilk State Park is on the campground and it was something we were pretty pumped to see. So before heading out we stopped by the lobby tent for the complimentary continental breakfast and enjoyed some artisanal breads with jam, yogurt, fruit and deliciously brewed coffee before heading off on our adventure. We knew there would be hiking and exploration involved in our trip, but really didn't think it would be as accessible and breathtaking as it was. The trails were all very well-marked and easy to navigate leading you along the Buttermilk Creek which has formed amazing gorges and cascading waters. We also made sure to take a quick 10-minute drive over to Taughannock Falls, which is one of the highest waterfalls east of the Rocky Mountains. It's a short, unchallenging hike that isn't all that interesting, but the end-result was magnificent. Proof that some of the best things in life really are free. On our way back the Summer sun was slowly setting and we could smell the fire embers in the air from the 'glampground'. We stopped into the lobby tent for happy hour and got in a quick round of bocce before the sun set and headed off to dinner at the delicious John Thomas Steakhouse located on the property. Being surrounded by the beauty of nature, being able to truly disconnect, tackling hiking trails and unforeseen adventures and the sense of community at the campground really deepened the connection between my boyfriend and me. It was an experience we were excited about going in, but didn't realize what unforgettable impressions it would leave on us going out. I'm so happy to share this happy place with all of you. See my complete list of recommendations below and remember sometimes we don't have to look any further than our own backyards to experience what a beautiful country we live in. HOTEL: Firelight Camps - open May-October for glamping || La Tourelle - spa/hotel on property for non-glampers!